The home screen of the Little Chomp HD iPad game is clean and precise. The background is the forest where Little Chomp helps his caterpillar friends become butterflies by gathering coins, berries, and treasures, as he bounces from leaf to branch to leaf. The graphics are reminiscent of the Bad Piggies iPad app. They are bright, modern, and refined. Visual dimension is accomplished by layering different hues of the same color. You can simply press play, access settings, get help, and check out standings with one touch from the home screen. A neat touch is the way the Facebook and Twitter icons have incorporated the developer’s branding with the fist clutching the social networks’ icons. When you press play, you start at the first level and unlock the next. The tutorial pop-ups visually complement the game play, and they simply explain the gestures required and share hints. When you have earned enough points, a tutorial instructs you to redeem your points to transform a caterpillar into a butterfly. The tutorials also help you to maneuver new obstacles throughout the game. 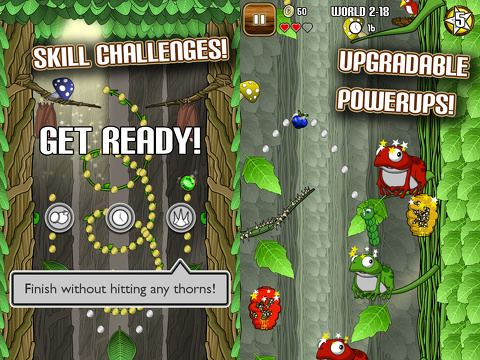 To play the Little Chomp HD iPad game, you use agile gesture controls to help your caterpillar navigate the course. The gesture controls remind me of Cut the Rope, as you must assess the gamescape to create successful gestures. When you start a new level, there is an overview of the course. You adjust the direction of the caterpillar by turning its tail with your finger. The path is highlighted with red dots. You pull and release, and the caterpillar sets off on its path. Hopefully, you’re gathering fruit and passing through as many coins as possible. As you encounter more obstacles, you may have to adjust and synchronize your gesture controls to move the caterpillar through the course successfully. As you jump through coins and avoid obstacles, you move vertically up the screen and see the similarities to Super Mario World. There is a fun soundtrack to accompany your caterpillar, as it grabs coins and earns points. You also earn points with quick completion times. 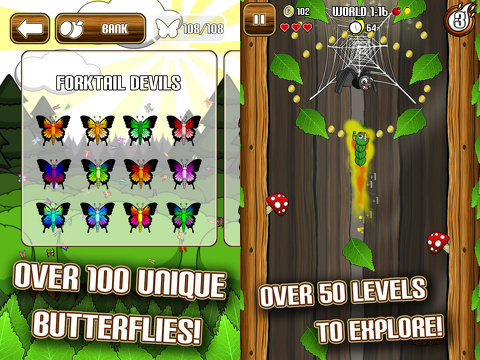 The Little Chomp HD iPad game is an excellent way to spend $2.99. The well-executed gesture controls and its fantastic attention to detail with graphics and music make it exciting and refreshing. AppSafari review of Little Chomp HD was written by Jenni Ward on December 3rd, 2012 and categorized under Action, Adventure, App Store, Games, iPad apps, Physics Based, Platformer. Page viewed 4421 times, 2 so far today. Need help on using these apps? Please read the Help Page.